One of my favorite genres in gaming is survival-horror, and in the late 1990s and early 2000s we were blessed with dozens of superb titles. Sadly, these types have games have either evolved into another style or disappeared altogether over the last decade. 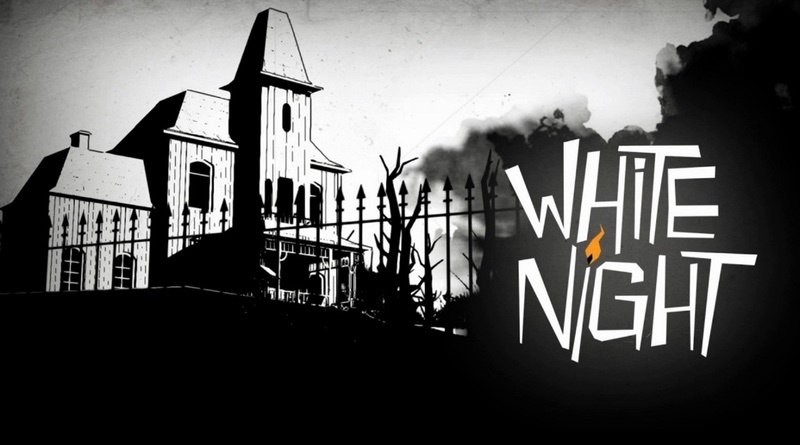 This month, fans of horror games are in for a real treat, as French developer Osome Studio brings us White Night on the Nintendo Switch. This game takes us back in time to the late 1930s. You play as an unnamed man who is in a car accident, hitting a woman, and is led to a seemingly abandoned house. From there you begin by attempting to locate the missing pedestrian and to try and find help. You start your search by exploring the eerie manor and unearthing clues and secrets that lie within. As you dig deeper you begin to learn more about the Vesper family and your possible connection to them. It doesn’t take long to realize you’re not alone and malevolent spirits haunt your every move. White Night is rather striking with its completely black and white visuals, giving the game a very eerie presentation. It took about 10 minutes for me to get used to the graphics before it felt natural. Light and darkness play heavily in the game. You cannot enter some areas or perform certain actions without light. Electricity works sometimes, but you’ll usually need to plug in a cord, adjust lamps, or solve another puzzle to proceed. Matches are needed to move around in darker areas, but they are scattered around the house and you can only carry 12 at a time. These burn out after about 20 seconds, and if you are trapped in the dark for too long, you risk a Game Over. There are other items to find, but these are all one-time use keys or other doodads needed to complete a puzzle. There is no combat in this game. As such there are no need for weapons. Some ghosts are stationary, blocking an area and to vanquish these you’ll need to find a direct light source to shine on them. Other specters follow or chase you around a room. You need to run from these, as contact results in death. The game uses auto-saves, which are plentiful, or you can sit in a lighted armchair to trigger a manual save. Each room you enter is filled with things to look at and read through. You can discover and collect hundreds of diary entries, newspaper articles, and photographs. If you wish to read all of these, you’ll be treated to the disturbing and frightening history of the Vesper family. There is so much to find and read that it all amounts to a small novel. Your character does some voiced narration during key plot points in the game, but I found him kind of dull and felt more of a connection to the Vesper family than to him. While I enjoyed the story, it doesn’t stack up to the writing of classics like Eternal Darkness or Silent Hill. The dark and gloomy atmosphere, creepy piano music, and the presence of spirits amount to a frightening game that kept me on edge while playing in the middle of night. There’s no real violence, gore, or disgusting creatures. Instead, White Night wraps the scares into psychological and atmospheric horror. There are a few things about this game that some gamers will not care for. The game utilizes fixed camera angles, much like the early Resident Evil games. Naturally, controlling this game takes a little adjustment, as it’s been many years since I went through a game with these viewpoints. Some of the load times made me think I was playing a game released in 2002. I thought the game started off rather dull, as there is a long intro featuring the credits, and after the car accident your character moves incredibly slow due to his injury. If you can plow through that, it definitely gets better. The overall length is about 3 or 4 hours and it’s not an overly difficult game. I really enjoyed playing through White Night. It was a more than welcome throwback to classic survival-horror titles, featuring a unique graphic design, eerie music and sound, and spot-on storytelling. My only qualms with it were the difficulty could have been ramped up, as well as the length increased. The load times were also a hindrance. Those with a taste for adventure or horror games should get plenty of enjoyment from this title. Presented in black and white and featuring a great story, White Night should satisfy horror adventure fans. There’s no combat to be found here, and expect a ton of reading, but if that’s your thing you’ll find lots to enjoy here. White Night was reviewed using a final retail Nintendo Switch download code provided by the publisher. Aaron got his NES in 1991 and has loved and collected video games ever since. In addition to gaming, he enjoys Stephen King novels, Twins Baseball, and his cats.